I moved it all… to Tumblr. I moved my blog over to Tumblr – it’s just nicer to use. I contemplated for a few months, but as with all things, I am super happy now. The Feedburner feed is moved, so no worries if you were just reading through RSS anyways. These posts will stay up for archiving reasons, but I will probably strip the rest down to the essentials. Also: the domain is a lot shorter. One hell of a year. Thanks, all! Careful: boring blogpost about my year ahead. I’ve spent the past two weeks at home, in Germany. I finally had some time to wind down, relax a little, and read. I haven’t managed to come even close to my goal of 80% couch time, but it’s all good. 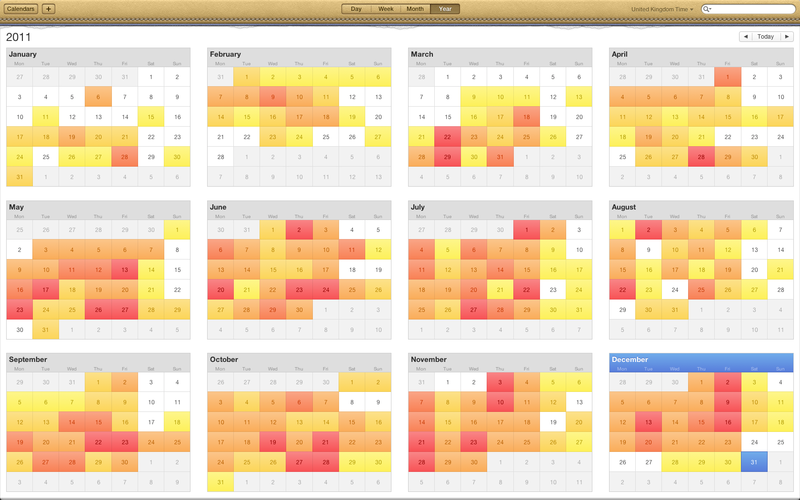 iCal in Lion looks fugly, but it gives you a stress indicator. Fair enough. – Seedcamp Events in Tel Aviv, London, Berlin, Paris, Barcelona, New York. I skipped Prague, Ljubljana, and Stockholm, but it was fun nonetheless. – Our huge US trip in March to the East and West Coast, with SXSW to top it all off was definitely the biggest strain on my sanity (and nanny-capabilities with 15 startups in tow). – Seedcamp Week in September – wow, what fun. And not much sleep. – A trip to San Francisco, Valley, and Mexico in October. Awesome fun with tons of new people in Kundavi, and of course the inevitable brain overload from the valley. Tomaz and Jakob at Vox.io were kind hosts in SF, I will have to make this a regular somehow. – Some smaller excursions to Germany, including the Pirate Summit, which will hopefully become a fixture in the European startup events calendar. Go Team! – Weekend getaways to the English coast, the Isle of Wight, and of course France for skiing with the ICE crew. – Isa moved to London in March and we moved to a beautiful new apartment in summer. I kid you not, it’s possible to live in London and have a quiet home. – We (Seedcamp) moved office to East London, which is awesome because lunch is more fun (less bankers and lawyers). – I tried all possible mobile phone operating systems and am back on an iPhone. Boring. – I started running. Somewhat. Sometimes. – We invested in 25 companies over the course of the year. This means crazy many new friends, work pals, calls, meetings, but most of all, it means an amazing set of people to work with beyond my team. It’s probably why I can bear it all. So, all is the same, all is new – and here’s to hoping that 2012 will rock as much or more. Q1 already looks like it will. – My friends are awesome. …check my tumblr. Pics and more. We are taking some of the Seedcamp winners of 2010 and 2011 on our now annual road show to the USA in March 2011. With a total of 14 companies, we will tour both East and West Coast, and end up at SXSW to meet up with the rest of the international tech scene. We will start off the trip on the east coast, visiting two of the most important tech hubs, New York and Boston, where we will also host 2 Seedcamp-format mentoring events to mix and mingle with local entrepreneurs, investors, and product experts. The New York event will be hosted by our friends and sponsors at Google. The Boston event is going to take place at the Hubspot offices (with a lot of help by our friends from Atlas Ventures). After a weekend break in Tahoe, we will spend the second week in the Valley, visiting, amongst others, Facebook, 500startups, the Google headquarters, various VCs, and meet the tech scene of the valley. We will host mentoring events at Google and our friends at i/o ventures. We will also go to the Northwest to visit two giants of tech – we will see both Microsoft and Amazon Headquarters, to get inspired by what was built in only the last decades. The grand finale will be at SXSW in Austin, Texas, where we will probably end up exhausted, happy, and with pockets full of business cards – a Seedcamp on the road, with loads of new friends and contacts to be made. I am about to leave on a two week whirlwind of a trip to the US, where we’ll take the Seedcamp winners of 2010 and 2011 to meet local investors and entrepreneurs. My first trip to the US in a long time, and my first trip to the West Coast/Valley ever. I’m beyond excited. Besides meeting some friends in New York and Boston, I will see some London folks in Tahoe and some of the Berlin and Lausanne connections in Austin at SXSW. If you are somewhere close, let me know, so we can meet up! I bought a Kindle about a month ago, and it was the best gadget purchase in a long while. I read about a hundred pages per day on it, because I take it everywhere (and I always think “it’s awesome” when I see it lying on my table). I actually pre-ordered it when it was announced, but reneged on my decision to get the 3G version – which stupidly put me at the back of the waiting list when I reconsidered. It’s smaller and lighter than a book and fits in a coat pocket easily. I just have it with me all the time and take it out on every bus or tube ride. It’s better to hold in one hand than a book. You can grab it at every corner and you dont have to awkwardly bend the spine by spreading your fingers. The screen is perfect for text. Forget an iPad for reading a book (or lots of them, for that matter) – it will strain your eyes. You have all that stuff with you – books, magazines, articles. I always travelled with at least one non fiction and one fiction book, and got the economist and some fun magazine at the airport. Lots of dead trees to lug around – not anymore. I use Instapaper like a madman now. You can bookmark long articles on the web and they are automatically synced. My own personalised magazine, and givemesomethingtoread.com has great content (hat tip to Johannes). Do not think iPad vs Kindle – purpose, size, weight, value, and most importantly the screen are not comparable. You buy this to read books. Think discman vs iPod. Doing only one thing means you are focused, and it carries over from a paper book. You can’t do anything but read with that, either. I love buying books, and paper, and the smell, and all that. I am not missing it at all. I own a ton of vinyl, but I love my iPod – you get the point. I’ve yet to put a value on a lot of features like notes, clippings, and the 3G usage. I am only reading on it, and I am already hooked. The question of 3G or not is not really important – if you can afford the extra 40 pounds, just get the 3G version, I am sure you’re only gonna miss it when travelling a lot. I like simplifying my life, and scratching the huge bookcase from my moving list feels great. Get your partner one for Christmas (I hope Isa doesn’t read my blog). Cause I am busy having a blast preparing Seedcamp Week. I can not describe how much fun, work, and emails I have. I stopped drinking coffee for a week because I am high on adrenaline. One apt description is that the people who were showing up in my feedreader are now in my email inbox, so it’s awesome. I have the best job in the world, and you can have some of that, too! We are looking for two people (Intern and a General hands-on person) at Seedcamp in London. You will have more fun and you will be more stoked by the cool stuff we are working on than anywhere else, so get in touch and get yourself some. Both positions are based in London – feel free to reach out and apply by emailing Philipp. Please include information about your background, experience, your work with startups and tech companies, and everything else you feel is relevant for the job. The job descriptions for the general management and internship positions should tell you more about our requirements. via seedcamp: We are growing – and looking for you! SRSLY, ask any questions if you are interested. You will be working directly with me, keeping Seedcamp running day and night, organizing cool events, and working with the best people in the European tech scene. Can’t be better if you are dabbling your feet in E’ship and are passionate about start ups. I am a tech-addict working for AngelList in Berlin. I love everything that lights up, moves, or makes sounds. This is my outlet for longerwriting. This is my office, my tumblr is the living room. I am very happy about every comment and question, and will certainly respond if you contact me.